In 2-quart saucepan, heat potatoes and 1 inch water (salted if desired) to boiling. Reduce heat; simmer uncovered 20 to 25 minutes or until tender; drain and cool slightly. Cut potatoes into cubes. 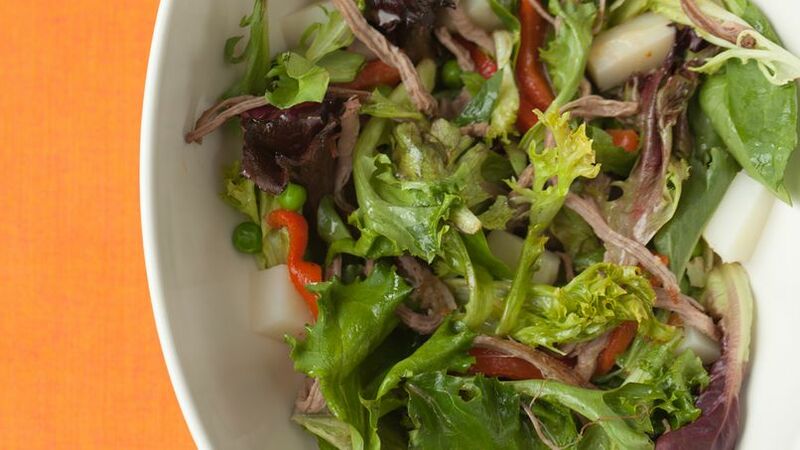 In large bowl, mix shredded beef, peas, greens and cooked potatoes. In small bowl, mix olive oil, vinegar, chicken bouillon granules, soy sauce and mustard. Pour over beef mixture; toss to coat. Garnish with roasted peppers. Looking for a hearty dinner? The serve this colorful salad packed with potatoes, steak, spring greens and frozen sweet peas.